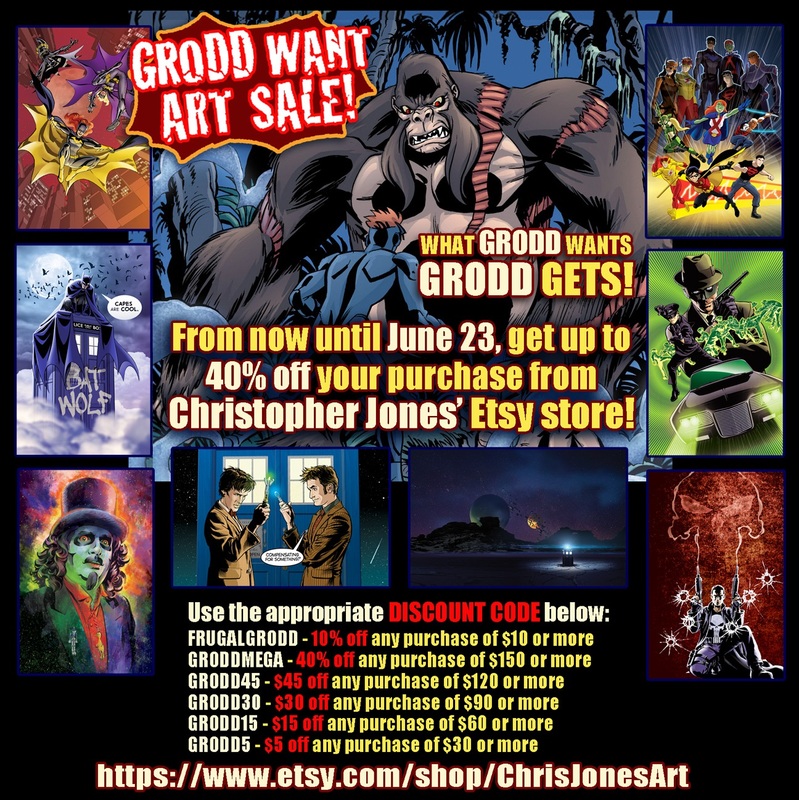 Christopher Jones Art Prints GRODD WANT ART ETSY SALE! I know that due to logistics and geography, a lot of you haven’t had the opportunity to see me at a convention or signing, but want to pick up one or more of my art prints. You probably know that most of my art prints are available for purchase in my Etsy store, but to show you I appreciate you all just as much as those able to visit me at events, I’m holding an online art sale! This is your chance to pick up that art you’ve been eyeing from me at a bit of a discount. My GRODD WANT ART SALE will run until June 23! Check out my Etsy Store at http://www.etsy.com/shop/ChrisJonesArt to see the full selection of art prints I have available. Use one of the discount codes at checkout. I won’t offer discounts on online purchases super often, but it is my plan to hold an online sale at least once per year going forward. Conventions, Doctor Who, Misc Artwork, Young Justice | Christopher Jones | May 23, 2015 2:36 pm | Comments Off on Christopher Jones Art Prints GRODD WANT ART ETSY SALE!